The first four OMD albums are due to be reissued on vinyl this November. Orchestral Manoeuvres In The Dark, Organisation, Architecture & Morality and Dazzle Ships have been mastered at half speed by Miles Showell at Abbey Road. The album reissues will be pressed on 180gsm vinyl and the sleeves will retain their die-cut elements (with the obvious exception of Organisation). The albums present the first phase of OMD’s musical career charting their initial outings on the DinDisc label, as well as their transition to parent label Virgin with the release of Dazzle Ships in 1983. OMD’s debut album Orchestral Manoeuvres In The Dark represents the ‘garage electro’ sound of early OMD, from which classic songs such as ‘Electricity’ and ‘Messages’ were turned into singles. It represents OMD at their rawest and the sleeve design by Peter Saville and Ben Kelly remains an iconic piece of art that’s endured since the album was first released in 1980. OMD adopted a more gothic approach for their second album Organisation, released in the autumn months of 1980. Featuring their international hit ‘Enola Gay’, the album also includes their long-form composition ‘Stanlow’ – a song inspired by the Wirral-based oil refinery that singled the band were returning home after tours. Architecture & Morality encapsulated the peak of OMD’s songwriting talent for the time. The album features a batch of OMD’s most well-known singles in the form of ‘Souvenir’, ‘Joan Of Arc’ and ‘Maid Of Orleans’. The album has sold over 4 million copies and is still considered a classic synthpop record today. 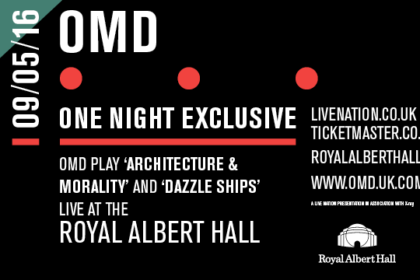 The “dysfunctional genius” of Dazzle Ships, as Andy McCluskey once described it, presented OMD at their most challenging. The musique concrète compositions, such as ‘Time Zones’, strike a fractured balance against the pure synthpop of ‘Telegraph’ and the Eno-inspired thrash of ‘Genetic Engineering’. The 1983 album destabilised the trajectory of success the band had enjoyed from the A&M period, but remains a much-loved album by OMD fans – and was later reassessed by contemporary critics in a more favourable light. The vinyl editions of Orchestral Manoeuvres In The Dark, Organisation, Architecture & Morality and Dazzle Ships are due for release by Universal Music on 2nd November. Pricing for all 4 albums via the OMD Website is £72. Plus all pre-orders will receive a free exclusive tote bag.